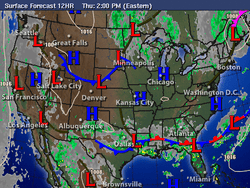 The Surface Analysis map shows current weather conditions. The 12 hour Surface Analysis map shows current weather conditions, including frontal and high/low pressure positions, satellite infrared (IR) cloud cover, and areas of precipitation. 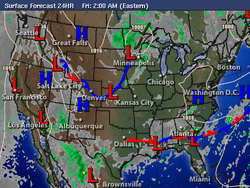 A surface weather analysis is a special type of weather map that provides a view of weather elements over a geographical area at a specified time based on information from ground-based weather stations. 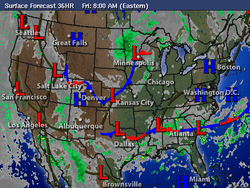 Weather maps are created by plotting or tracing the values of relevant quantities such as sea level pressure, temperature, and cloud cover onto a geographical map to help find synoptic scale features such as weather fronts. The first weather maps in the 19th century were drawn well after the fact to help devise a theory on storm systems. After the advent of the telegraph, simultaneous surface weather observations became possible for the first time, and beginning in the late 1840s, the Smithsonian Institution became the first organization to draw real-time surface analyses. Use of surface analyses began first in the United States, spreading worldwide during the 1870s. Use of the Norwegian cyclone model for frontal analysis began in the late 1910s across Europe, with its use finally spreading to the United States during World War II. Surface weather analyses have special symbols which show frontal systems, cloud cover, precipitation, or other important information. For example, an H may represent high pressure, implying good and fair weather. An L on the other hand may represent low pressure, which frequently accompanies precipitation. 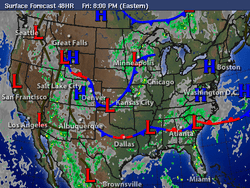 Various symbols are used not just for frontal zones and other surface boundaries on weather maps, but also to depict the present weather at various locations on the weather map. Areas of precipitation help determine the frontal type and location.